'Keeping things simple' is shaping up as the latest regulatory nightmare for the big banks. Having spent the best part of four years coming to terms with a complex set of rules around their capital structure, the big banks could be facing something much scarier and costly - simple reforms, based on old fashioned ideas. Rather basing capital needs on risk weighting of assets, the regulatory winds may be shifting to include the rather more straightforward calculation of leverage ratios. The push to simplify the complex set of global banking rules that have built up over the past decade is being driven by US and European regulators who are determined to shrink the biggest banks and make them more conservative. It's a change that on some estimates has the potential to almost double the amount of extra capital Australia's big four banks may need to hold and therefore seriously erode their return on equity (a key measure of profitability). It could potentially also remove the autonomy big banks enjoy in saying just what is a safe capital backing for their loans. The risk-based capital regime has been central to banks' capital needs since 2004, when the Basel II accord laid out a new set of standardised international regulations. Following the Global Financial Crisis it was back to the drawing board and Basel III was rubber stamped by G20 leaders four years ago. Once again the aim was to reduce the likelihood of bank failures and once again risk-weighted assets were central in defining the banks' capital requirements. This regulatory capital, or Common Equity Tier 1 (CET1) capital, is expressed as the ratio of capital that must be held as a percentage of risk-weighted assets. However this does suffer something of a credibility problem which was recently highlighted by the chairman of the Australian Prudential Authority, Wayne Byres. Putting it about as bluntly as banking regulators can, Mr Byres said recent efforts to strengthen confidence in the banks' ability to withstand future shocks "are being undermined somewhat by an increasing lack of faith in the use of internal models by the largest banks to calculate risk-weighted assets." That's right, the big four banks determine the risk weightings of their assets and, in particular, the assets in their mortgage portfolio. To be fair, they only earn that privilege after rigorous review by the regulator of their data capture and risk measurement practices. However, it has seen the banks steadily increase their balance sheet leverage, just by arguing the risks in their mortgage lending are shrinking. 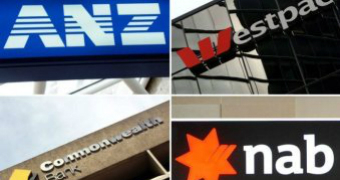 The big four banks are facing a significant increase in capital requirements, one way or another. BBY bank analyst Brett Le Mesurier says such arguments are based on an analysis of data which is necessarily historical. "The implication from such an analysis is that the past is a reliable guide to the future," he points out. "Since the future is just that, no one knows whether or not such a major assumption is sensible. "All we can say is that the last two decades have delivered an extraordinary period of economic growth and increasing house prices." Mr Le Mesurier argues the reasonable fear is that the future could be quite different, "and fears should form the basis of a capital structure." Given that CET1 is basically ordinary equity less goodwill divided by risk-weighted assets, to increase your regulatory capital banks can either boost their equity, or reduce the riskiness of their assets. Raising equity capital has the nasty side effect of lowering returns on equity and profits. Lowering risk ratings has the opposite effect. As Mr Byres told his audience of risk managers, "doubts about the reliability of risk measurement in the denominator mean that the resulting ratios lack credibility as a reliable measure of financial strength." Basically, if one part of the equation is dodgy, the whole equation is dodgy. Mr Byres noted that, at the height of the GFC, investors ditched risk-based ratios as a measure of a bank's health and quickly reverted to a leverage ratio, a figure that hasn't been finessed by the bank's assessment of the quality of its risky assets. Why are mortgage portfolios getting less risky? Back before 2004, the risk weighting on home loans was deemed to be 50 per cent or, put another way, half the loans were considered at risk and half weren't. Non-housing loans are generally 100 per cent at risk. An example of how risk weighting revolutionised banks' lending power can be seen in a very basic example. Using 10 per cent as a simple figure for bank leverage, $10 worth of assets can support a $100 loan. The beauty of saying that the risk of a mortgage is half that of any other loan, is that $10 of assets can now support a $200 loan. The bankers argued their in-house risk management was a far more sophisticated beast and their modelling could accurately determine what percentage of loans were at risk much more accurately than a one-size-fits-all figure of 50 per cent, or 35 per cent as it became after 2004. The regulators bought it and risk weightings tumbled. When those risk weightings fall to say 15 per cent, which is pretty much thereabouts for the CBA and Westpac, just $1.50 in assets will now support a $100 loan and the balance sheet is geared by a multiple of 67, rather than 10. 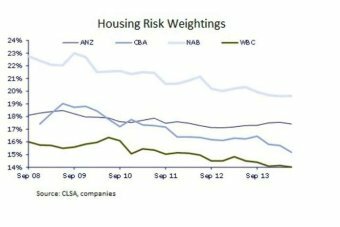 CLSA's leading bank analyst, Brian Johnson, recently published research showing the risk weightings for the big four banks, with the exception of ANZ, have dropped around 200 basis points since 2008. Despite the four banks all operating in the same market, making loans on the same assets, their internal systems throw up quite different calculations on the riskiness of the loans. In his recent speech, APRA chairman Wayne Byres pointed out recent studies by the Basel Committee finding excessive levels of variability in bank calculations of risk-weighted assets for identical portfolios. And, rather disconcertingly for the banks, he noted: "In light of these outcomes, the chairman of the Basel Committee has made it clear that there is a problem, and something must be done about it." It's also interesting to note that the risk of the loan books continues to fall in the face of spiralling house prices and the rancorous debate over the sustainability of the prices being paid. Smaller lenders, such as the regional banks, are not trusted to make the same calculations, as they haven't been able to demonstrate to APRA they have the same ability to capture and analyse data associated with their lending risks. Consequently they are faced with a minimum risk weighting of 35 per cent which puts their shareholders -and arguably their customers - at a disadvantage. In its submission to the Federal Government's Financial System Inquiry, the Bank of Queensland noted that 29 per cent of the Commonwealth Bank's $341 billion housing mortgage portfolio is risk-weighted at just 2.9 per cent. "This risk-weight translates into a requirement that the bank holds only around 26 cents in equity against every $100 in loans," BoQ argued. "In contrast, a regional bank with exactly the same loan portfolio would have to hold around $3.15 per $100 of loans." In other words, the CBA can achieve leverage on these loans of around 380 per cent compared to regional bank's maximum leverage of 31 per cent, and be a lot more profitable as a direct result. Last year, the key regulators in the US put forward the disturbing proposition for the largest banks that their tier 1 capital should measured against the true value of every asset on the balance sheet; every loan, property and investment rather than just their self-calculated risky assets. The Federal Reserve, Federal Deposit Insurance Corporation (FIDC) and Office of the Comptroller of Currency proposed that the big banks needed a leverage ratio of 5 per cent and their FDIC-insured bank subsidiaries would have to increase their leverage ratios to 6 per cent, double the standard previously agreed to. The Wall Street Journal reported that banks such as JP Morgan faced a capital shortfall of $US15.6 billion, while others, such as Wells Fargo, actually enjoyed an excess of capital under the proposal. BBY's bank analyst Brett Le Mesurier tested the 6 per cent leverage ratio requirement against Australia's big four and found they all faced significant capital shortfalls and, under his modelling, would face sharp falls in their share prices if obliged to meet the standard. Currently Australian bank analysts aren't rating the possibility of a 6 per cent leverage ratio being imposed on the big four banks too seriously. Most are tipping that the minimum CET1 ratio will be lifted from 8 per cent to more than 10 per cent and mortgage risk weightings will have a standardised minimum of 20 per cent across the banks. CLSA's Brian Johnson says it would be a clear negative for all big banks, but particularly so for the dominant players in the mortgage market, the Commonwealth and Westpac. "Should the Financial Stability Inquiry and APRA further increase housing risk weightings to a rumoured 20 per cent floor, the CBA and Westpac would have to raise even more capital given their housing skews, particularly to investment property, and low housing risk weightings," Mr Johnson recently noted. Estimates vary, but banks will undoubtedly have to hold many billions of dollars in extra capital to satisfy the new regulations heading their way. Certainly they're big numbers, with some analysts having calculated the additional capital required under such a scenario as being equivalent to the creation of a fifth major bank. APRA chairman Wayne Byres says the regulator's preference is to find ways to strengthen the current risk-base regime. However, his message did carry a very pointed warning for the banks. "Unless investors have faith in the resulting risk-based capital ratios, they do not serve their full regulatory purpose and, if that is the case, simpler metrics will inevitably become more important - and potentially even binding," he said. Just what new bank regulations the G20 leaders will endorse at their November meeting is still a very open question, but it's reasonable to say that the reform process is far from over. Banks will still make serious money from home loans and pretty well no amount of extra capital will totally protect them from the vagaries of the global capital markets. As the APRA chief concluded, there is still one fundamental reform to be made. "If we want to be able to say we have done the best we can to avoid a repeat of the excesses that built up during the crisis: that is, improve the behaviour of the industry itself." And that's likely to be toughest job of all. Newer PostGreat #ideasboomAU! Let's apply this thinking to #ausbiz finance, not just start-ups. Finance to grow.